How to Move to Canada? - Gateway to Canada | Canada Immigration Consultancy! Because Donald Trump may soon to be the next president of the United States of America, it looks like many Americans are now thinking of moving to Canada. At least according to this Washington Post article. Donald Trump was projected to win in at least seven states. Chris Christie, who endorsed Trump last week, was shown standing behind the Republican presidential front-runner wearing an expression of unmasked horror. And, the government of Canada’s immigration website was experiencing delays. Information about How to Move to Canada are available for free at http://cic.gc.ca. It is not mandatory to hire the services of an Immigration Lawyer/Consultant. But immigration is not a simple process. Small mistakes may cause big problems - refusal of your application. If this is your first time to process an application, you may be susceptible to mistakes. The advantage of hiring an experienced Immigration Consultant in your plan of moving to Canada, is that you will be guided. You can bank on Canadian Immigration Consultancy's over 20 years of experience in visa application processing. 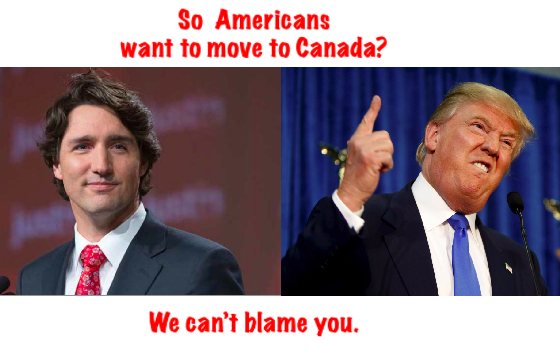 So if you want to to know how to move to Canada, you just have to contact us.